See Bloom Reports from the Anza-Borrego Desert: 2018-2019 for the 2018-2019 summary of the bloom. This page gives background on this and previous bloom reports. The bloom report page reports the current bloom status in Anza-Borrego Desert State Park and nearby areas below 3000 feet elevation. We began using this expanded area in 2010-2011. Prior to then, the pages were restricted to the Borrego Desert portion of the Park. That page also gives general information about the bloom for all species in this area, with emphasis on the annuals that are responsible for the widespread showy blooms that appear in some years on the desert floor. This page also gives some general information on what is needed to germinate those annuals, and what is needed to sustain the annual bloom. The information here is by no means a definitive list to what is blooming at all locations in the Anza-Borrego Desert; it only records the species we've seen in bloom on trips that occur roughly every fourth day, occasionally augmented by observations from other people. Because the locations change, the numbers of species in bloom, and the number of plants in bloom, cannot usually be directly compared from trip to trip. 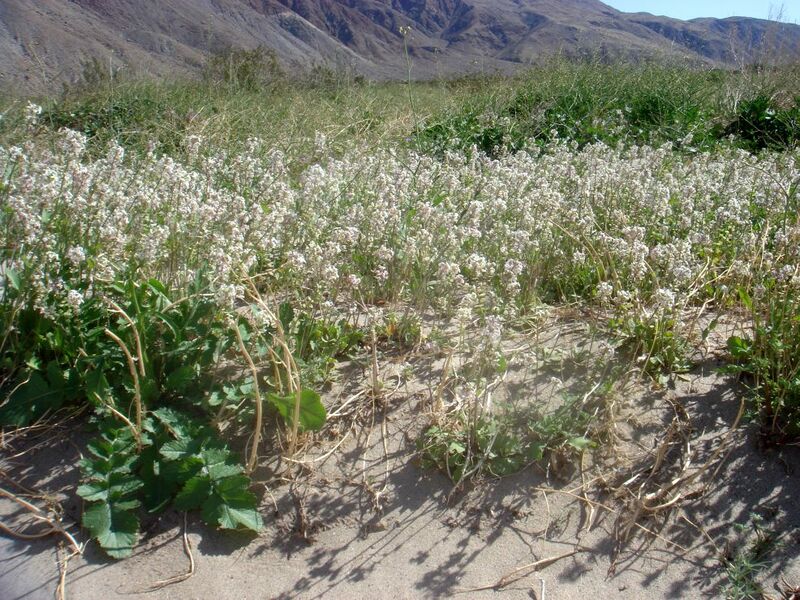 However, the information here will give the reader an idea of what the bloom is doing in the Anza-Borrego Desert. Note that there is often quite a difference in the annual bloom between the moister canyons west of Borrego Springs and the drier areas around the Badlands. Similarly, even within those canyons on the west, there can be large differences between the north-facing and south-facing slopes, and between canyons with permanent water, like Borrego Palm Canyon, and drier canyons. In the drier areas to the east, there can be large differences between the edges of washes and the middle of washes, and between shady canyons and open areas. Location matters!. There are two main rain windows for annual germination in the Borrego Desert: monsoonal / summer rainfall, received from thunderstorms in July, August and September, and fall / winter rainfall received from October through January. Monsoonal rainfall germinates 31 different species of summer annuals that bloom in September and October. Occasionally, fall / winter rainfall occurring in October will germinate some of these summer annuals. In addition, some perennial species respond best to monsoonal rainfall, and produce their best shows in September. See Monsoonal Species for a list of the species that respond significantly to monsoonal rainfall. The rest of this section discusses only the "normal" annuals seen by most visitors to the Borrego Desert in the late winter and early spring. The timing of fall / winter rainfall is extremely important for the annual bloom. Rainfall received in the summer and early fall will not germinate the annuals that bloom in February and March. Rainfall received after January will either not germinate those annuals, or will germinate them too late for them to produce a robust bloom in most years. Thus rain must fall in October, November, December and/or January in order to germinate the annuals that produce the showy mass displays. The potential showiness of the bloom declines when the germinating rainfall gets later in January, since the annuals don't have enough time to grow very large before the increasing heat of March ends their bloom. The amount in a single storm is also important. Native annuals require at least about an inch of rainfall, received over no longer than a period of something like several days, in order to germinate. Our native annuals have learned the hard way that less rainfall doesn't guarantee enough moisture in the soil for them to produce seeds. Many annuals won't even germinate with two inches of rainfall in the Badlands and similar soils. See Predicting Desert Wildflower Blooms - The science behind the spectacle from the Arizona-Sonora Desert Museum for information relating to Arizona desert blooms. Note, however, that there is a big difference between the Sonoran Desert germination in Tucson and in Borrego Springs. Unfortunately, the carpets of flowers have become much diminished since about the year 2000 due to the invasion of Sahara mustard, Brassica tournefortii. This non-native weed has taken over most of the sandy areas that produce the big displays, crowding out our native species due to the unnatural advantage that non-native species have. Essentially the entire Borrego Springs city area and environs inside the boundaries of Anza-Borrego Desert State Park, along with the west half of the Borrego Badlands, are now close to 100% mustard. If you stand at nearly any place in the city of Borrego Springs early in the season after germination, the green you see around you and on hillsides is nearly all mustard. Similarly, there used to be an extensive stunning field of hairy desert-sunflower, Geraea canescens, along the eastern portion of Henderson Canyon Road before the Sahara mustard, Brassica tournefortii, took over this area. See also picture taken on 2 March 2009 which shows how patchy this bloom has now become, amidst the extensive non-stunning field of mustard. Park volunteers weed some areas of this species (Borrego Palm Canyon, Plum Canyon, and a number of patches along Henderson Canyon Road in Borrego Springs in order to recreate the sunflower displays there) in order to preserve some small areas for these native species. This effort has been tirelessly spearheaded by Park Botanist Larry Hendrickson. For pictures of before and after the mustard invasion, see The Desert Museum's Sahara mustard (Brassica tournefortii) page. In fact, Tom has been in the desert at such a time of peak bloom, with perhaps 50 species in full bloom within a mile of his location, and had visitors ask him where the flowers are. Clearly, they were looking for carpets of flowers, and weren't interested in walking around to find all the species in bloom at that location. Most of the time, we use the latter definition of Peak Bloom, but we also try to mention when the carpets of flowers are present. See observed dates of peak bloom in 2008-2009 and in 2009-2010 for various locations. Heat is the main factor that terminates a bloom. Tom has seen a very robust February bloom abruptly end in just two weeks in March when 90° heat begins and is sustained for a few weeks. On the other hand, the bloom can go into April in years with cooler March temperatures. See latest plots of bloom numbers. Copyright © 2008-2018 by Tom Chester, Kate Harper, and Mike Crouse.